In addition to Princess and the teacher, Tyger, there are four other children (all of the other four are teenagers, actually) who are part of Project GILGAMESH. 1. Teleport: instantly travel a number of inches equal to 100 times his current Power. PR = 3. 2. Non-Corporealness: PR = 4 per hour. 3. Animate Shadows: similar to Solid Energy Illusions, can animate up to current Power x 2 Creation Points. Damage is by a chilling touch. Range = 26". 4. Invisibility: PR = 1 per hour. 5. Special Requirement: Can only use powers when shadows are present (that is, not in bright light or total darkness). Teleport must begin and end in shadowy areas. Origin & Background: David never wanted to be noticed. Getting noticed only meant that his father was paying attention to him, and that never ended well. 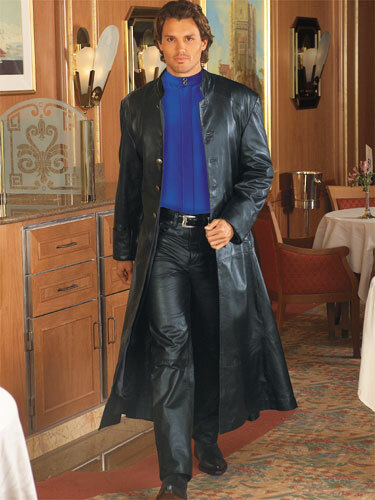 When his father came home drunk and started beating his mother, David's powers manifested as he faded into the shadows, then the shadows came to life around him and stopped his father. He wasn't in time to save his mother, who died of cerebral edema several days later. David was put into foster care, then found his way into Project GILGAMESH. Origin & Background: No one really knows where Linda came from. She was found on the streets, seeming about 14 years old, complete with wings, but without any memories of where she came from. She was named by one of the technicians at Project GILGAMESH, and knows no other life. She has a very strong crush on David/Umbra, and will follow him anywhere. She carries a sword (+2 to hit, +1d6 damage) made of adamantium-like glass (structure 15), which she was carrying when found. 1. Invisibility: PR = 1 per hour. 2. Force Field: range = 30". Can create a wall up to his current Power inches on a side, and other abilities as listed in the rules. Origin & Background: Very shy, Michael prefers not to be touched or seen. When his mutant powers manifested, they reflected his very withdrawn personality. His parents were at a loss for how to deal with him, so when some men from the government said that they could help him, they were relieved and let him go without a fuss. Michael doesn't blame them, as he knows that their life has been hard. 1. Cat Powers (Heightened Agility +20; Speed Bonus +90" ground; Natural Weaponry +2 to hit, +4 damage in unarmed combat; Heightened Senses: Night Vision). 2. Regeneration: take an action to heal full healing rate up to once per turn. Can't regenerate damage from silver weapons. 3. Heightened Defense: all attacks against The Cat are at -4 to hit. Origin & Background: A fan of anime from a young age, and especially fond of cats and catgirls, Kat was delighted to discover that she had the grace and agility of a cat, and then found that she could extend claws from under her fingernails and her eyes had changed to look like a cat's! Obsessed with catgirls, she dresses in that style all the time. The officials of Project GILGAMESH have been very permissive of the unusual preferences of the kids on the theory that repressing them might cause the mutant powers to become less useful. 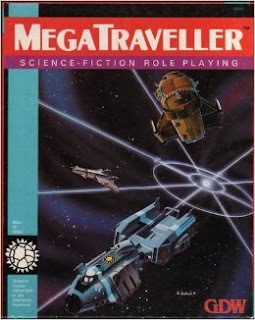 As most people know, there are four editions of Traveller that have seen print from companies with which Marc Miller is or has been directly involved, one edition from Mongoose, and a few editions converted to other game systems (or "engines", as some would have it). The two most well-known of the latter are GURPS Traveller and T20 (the D20 system Traveller conversion), but others such as a HERO System conversion and even a D6 System conversion exist. These seem like quite different animals to me, as the conversions, by necessity, focus on the default background, while the Marc Miller games (and the Mongoose edition; in fact, the Mongoose edition offers several alternate settings) can be used with that background or with any other the Referee wants to design. In addition to those editions, Marc Miller is about to print a "definitive" edition, Traveller5. Here's a quick overview of the editions, including some notes as to how they differ from each other. First was classic Traveller. Often called "CT" or the "LBB Edition" (for "Little Black Books", which was the context that I first heard that acronym used, only later seeing it used for the Little Brown Books of original D&D). This was actually several sub-editions. In the very first edition, the space combat rules used a scale of an inch on the table being 1000 miles scale, and a turn being 15 minutes. One G of acceleration for one turn gave a vector of 2" on the table. This was changed quickly to a scale of one cm on the table being 1000km scale, and a turn of 1000 seconds, or 16 ⅔ minutes. In this version, one G of acceleration for one turn gave a vector of 10cm on the table. Other than that change, the game was largely the same through all printings of the LBBs and the squarebound paperback edition called The Traveller Book. This was the edition in which a character could famously die during character creation (which made more sense than it sounds, but I'm not writing an apologetic here). Combat was arbitrary, with armor and weapons cross-indexed on a table to determine a modifier to the attack roll, and damage being rated in an absolute number of dice if a hit was scored. Damage points were applied directly to the physical characteristics of a character. The only dice used in the game were six-sided, frequently used as a 2d6 roll. As time went on, a lot of additions were written, such as the "enhanced" character creation for Army, Navy, Marines, Merchant, and Scout characters, vehicle design (the first in gaming that modeled the mechanical parts of a vehicle and derived a set of ratings for the game from those, in the Traveller miniatures rules called Striker), alternate combat systems (in Snapshot and Azhanti High Lightning, mainly, but Striker had an influence as well), robot design, enhanced star system generation, and so on. As those various details accumulated, the game started to become somewhat unwieldy. A new edition was called for (this was 10 years after the game was released, so it wasn't like they rushed into this), and the result was the second full edition, the atrociously-titled MegaTraveller, which is usually abbreviated "MT". Character creation was revised a bit, to give players a little more control over their characters and to reduce (but not eliminate, thank goodness) the "death in character creation problem" that some perceived in the original game. Many aspects of Striker combat were incorporated into the game, such as the vehicle design system (expanded to starships, though the derived ratings were different for starship combat, since it was treated much more abstractly even in terms of damage effects) and the combination of weapon penetration and armor ratings. Because the systems were not perfectly integrated, damage became a little complicated, and characters tracked two entirely different sets of hit points! One of these was the traditional Traveller system of applying damage to the characteristics of the character, while the other was derived from Striker damage ratings, and was a pair of hits ratings (the first for unconsciousness, the second for death) based on the "Life Level" of the character, which is the sum of the first three characteristics. Again, this works better in practice than it sounds, but it is still an obvious kludge. Personally, of the published editions so far, this is my favorite, though I strongly dislike the "Rebellion" background and the events that follow on from that. As time went on, a number of additions were made to the game, many of them from the company called Digest Group Publications (DGP) that belonged to the people who did most of the work in revising the game, and it continued to grow, but never became the unwieldy mess that classic Traveller became from its additions. [ADDENDUM: 26 June 2012] In the spirit of the game, let me take a moment to issue a correction, and point out that one of the biggest problems with MegaTraveller was the immense amount of errata and corrections that were issued over the six years of its active publication. Most of those have been consolidated, and you can find them, for instance, here. There is also errata for the other editions there, but none of them approach the extensive errata issued officially for MegaTraveller. Well, the errata for T4 comes pretty close, I suppose. However, GDW was making some… let's call them "interesting" decisions in the early 1990s. One of them was to create a "house system" to which all of their various games would be converted over time. This was based on the second edition of their popular (at the time) Twilight: 2000 game, and was an outgrowth of the system that they had developed for the excellent Space 1889 game (I'll talk about that one another time). Since the Rebellion background was growing interminable, they also decided to, in effect, reset the background. In my opinion, this was the biggest mistake that GDW made in its entire history. Through a dramatic plot device, nearly the entirety of known space in the Traveller default setting was subjected to an apocalyptic computer virus that nearly wiped out the spacefaring races. One area was spared this fate (through the foresight of its enlightened ruler), allowing more traditional Traveller games to continue if desired, but the idea was now that players would be trying to rebuild interstellar civilization. 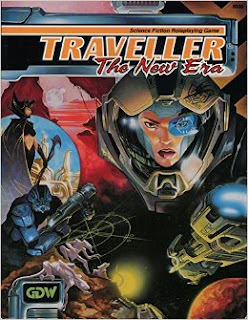 The new edition was called Traveller: The New Era, often abbreviated "TNE". I'm not really going to discuss this edition, as it was a dramatic change from the traditional Traveller system. It did include a book called Fire, Fusion, and Steel, which was a complete design system for everything from robots and guns to cars, tanks, ships, and even spacecraft. This was the forerunner of such gearhead books as GURPS Vehicles and CORPS VDS. Some of the "alternate tech" in the book made it clear that GDW intended to convert its other SF RPG, 2300AD (formerly known as Traveller: 2300, but changed when it became apparent that too many people were confused by the similarity of the title to Traveller, and another game that I intend to discuss on this blog in the future), into the system, but this never occurred. I do like TNE, but not enough to make it a regular option at my table. It did include some excellent supplementary material, such as the space combat boardgames Brilliant Lances and Battle Rider, a superior edition of the miniatures game (Striker II), a colony mini-game designed to be integrated with a roleplaying campaign (The World Tamer's Handbook), and so on. It was also a little frustrating, since it came out only 6 years after MT was released, and lasted less than 3. Sadly, GDW closed its doors, relegating TNE to the dustbin of history (though you can get PDFs of it, from RPGNow or DriveThruRPG). 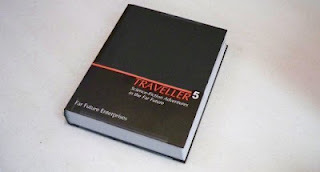 Three years after releasing TNE, a new company formed by Marc Miller, FarFuture Enterprises, would release a new edition of Traveller which went back to its roots. Taking a cue from MT, it made character creation more player-friendly (enhancing choice, reducing pre-play lethality). Combat was greatly simplified such that now armor simply reduced the dice of damage rolled when a hit was scored, and damage was returned to its CT elegance. 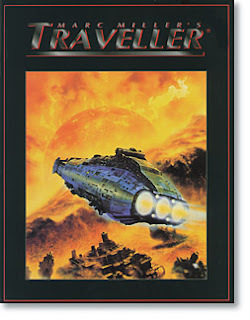 However, this edition, called Marc Miller's Traveller or Traveller4 (abbreviated almost always as "T4") was plagued by typos and insufficient development. A number of supplements were released (notably, the superior Pocket Empires, which introduced a mini-game of interstellar economics and politics), but the problems in the main rules and in the new Fire, Fusion, and Steel attached to it helped prevent the game from gaining any traction. That brings us to today, 16 years after T4 was inflicted on an unsuspecting world, and 35 years after the game was first released. Later this year, Marc Miller's Far Future Enterprises will be releasing, at long last, Traveller5. With luck, this will be a definitive edition of the game, incorporating the best of all of the editions. I doubt that sunny prospect will occur, but I can dream. If it doesn't, I notice that Mongoose's edition of the game includes the OGL, allowing third parties to use large portions of their text verbatim. You can find a link to their developers' kit toward the bottom of the sidebar on the left side of this blog. I would be interested in using that to put together my own version, taking what I consider to be the best of each edition (and stealing liberally from other games as I desire). You can bet that it would look a lot like MT, just integrated more thoroughly. But I have a lot of other projects to get to first, so I am hoping that T5 is all it can be. The other major option is GURPS Traveller, which makes use of an alternative timeline in which the Rebellion of the main background did not occur. I like this, since one of the reasons that I am no longer as fond as I once was of the Imperium background is that we know how it is going to turn out. Everything is for naught. Anything you build will only fall into the pit of Virus and have to be rebuilt. The setting is not endowed with the infinite possibilities of the future, since we know what the future must be. I hate metaplots, is what I'm saying. GURPS Traveller's alternate timeline erases the metaplot from the setting and allows players to chart an uncertain course into a dynamic future again. Unfortunately for me, Steve Jackson Games has chosen to present the rules updated for GURPS 4E such that they focus on the very early part of the setting where Terra is taking its first tentative steps among the stars, and meeting with the old and decadent Imperium (later to be called the First Imperium, as the Imperium of the main part of the setting is called the Third Imperium). This is unfortunate because it means that they have not converted a lot of the technology over to 4E standards. Ah, well. It's not like I haven't been moving away from GURPS recently. Designed, point-bought characters just don't meet my needs at this time. If you can't come up with story or scene ideas from these pictures, you aren't trying. Best of all, these things are all images from real life. If your heroes aren't as brave as these children, then they're doing it wrong. A psychopomp god at the symbolic crossroads of a city. the World up to here? This company makes real-life secret doors. You may find their ideas of value. Tap-dancing Satan. Your argument is irrelevant. Also, let me reiterate, tap-dancing Satan. On Lawrence Welk. There are people who are looking forward to "uploading" their minds to computers. This should prove a useful corrective to their wide-eyed optimism. 1. Time Powers: a) Time Stop - PR = 8, take an action to activate, then take a full turn in which no other characters can act, though already active defenses will be in effect; b) Time Jump - vanish, then reappear in the same place a number of rounds later, PR = 1 per round jumped. He can only have one Time Power active at a time. 2. 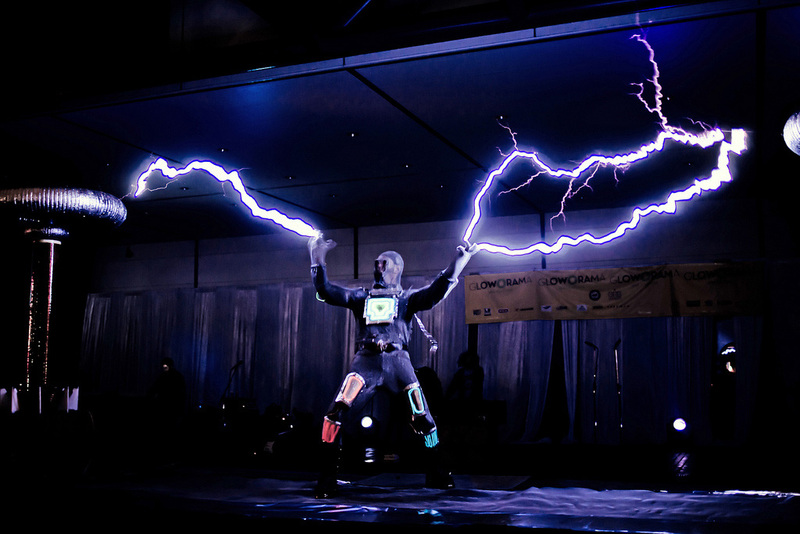 Teleportation: instantly travel a number of inches equal to his current Power score, PR = 1 per use. 3. Dimensional Travel: time travel, PR = 10 per journey. Origin & Background: When his mutant powers manifested, the orphan Justin used them to embark on a career of theft, stealing objects out from under the noses of their guardians. Finally captured by a Special Forces team equipped with advanced technology, he agreed to work with Project GILGAMESH as a trainer in exchange for immunity from prosecution for his prior crimes. When he has to fight, he likes to use a pair of Bowie knives (+1 to hit, +1d2 damage) to cut down his opponents between ticks of the clock. Never having had a family of his own, he is having some difficulty coming to terms with his new relationship with the kids of GILGAMESH. One of the things that occasionally shows up in rule sets is the idea of "luck" as being something that a character can have that is not connected to the normal luck of dice rolling. For instance, in Fantasy Wargaming, almost every interaction with the rules is affected by a luck roll that can itself be modified by the native luck of the character (as a special ability gained during character creation). In GURPS, there are several types of luck advantages, each of which allows varying benefits, such as re-rolling dice (the most common) or narrative benefits (like "Serendipity", which forces the GM to include one "fortuitous but plausible coincidence" per game session). CORPS Luck causes all rounding done in any calculation (except character creation and calculations that do not directly affect the character) to be in the player's favor. Some games have Luck as a characteristic (such as Tunnels & Trolls and Flashing Blades) or as a roll based on a characteristic (the Luck rolls of Basic Roleplaying and its progenitor, RuneQuest, both of which are based on the Power characteristic). But what is "luck"? Why should it be different than just the result of the series of dice rolls made during the game? 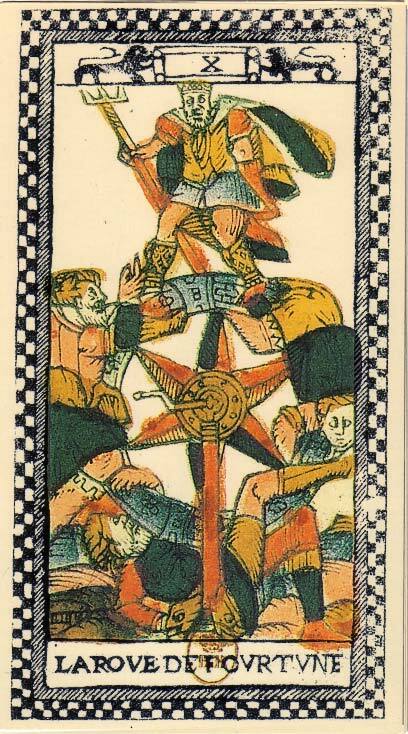 Obviously, in those games which include it as a separate concept, luck is an active force in the game world. Rather than being a description of events after the fact, it is a prescriptive concept that rests in certain people and not in others. It (usually) can have the qualities of "bad" or "good", so that those cursed with bad luck see detriments in the game world, while those blessed with good luck see benefits. From this, we can conjecture that it must be an actual force in the world, and not just a description of relative fortune. The term came late to English, but was based on much older concepts in Northern European (Germanic, Scandinavian, and Celtic, mainly) societies. In those societies, the success of a community, or a person, derived from its connection to the invisible world. 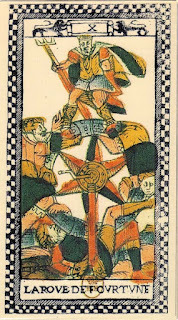 In most cases, the community would have a connection through its sacrificial religion, especially through the institution of sacral kingship, which is the origin of political kingship. 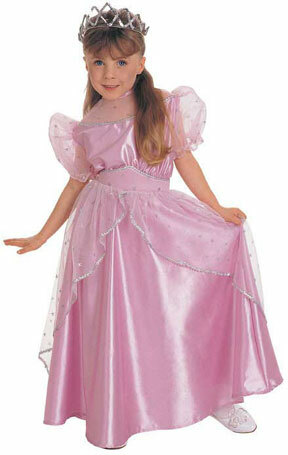 In this institution, a person would be chosen as the representative of the community to act as a sort of high priest. His (or sometimes her) duties would include observing various ritual taboos, engaging in ritual activities, and living a virtuous life. Failure in any of these was thought to bring ruin on the community. An individual would have a similar connection through his or her particular ritual and personal actions that would affect his or her life. For instance, a person might build his house on an elf path and see his luck drain away, or she might sing a particularly pleasant song in a place that the elves are present and find that she is afterward living a charmed life. On the larger scale, a bad king (for instance, one who gave bad judgments) would bring ruinous weather, unchecked banditry, and failed crops to his community, while a good one who observed his taboos, was pious, and embodied the virtues of his people would see pleasant, peaceful days and bountiful harvests under his reign. So, "luck" was the favor of the invisible world. That matches pretty well with RuneQuest and Basic Roleplaying, where Power is also the characteristic that is associated with spirits and magic. It also fits well in games like Flashing Blades, where God has ordered lives for good or ill. What would be interesting would be to see ways of affecting the luck rolls and advantages. 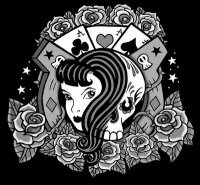 Luck could be used as a way of enforcing alignment (or whatever) restrictions, by making characters who do not live up to their professed philosophies lose luck, and those who hew closely to the restrictions of their ethos gain it. OK, for a lot of people, D&D is where it's at. 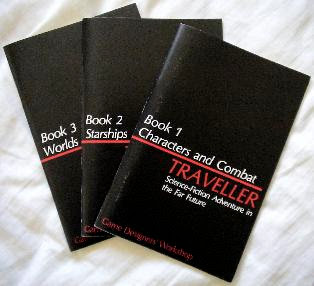 I do like me some D&D, for sure, but my main gaming love has always been Traveller, ever since I first saw a copy at the small bookstore where I got all my earliest gaming stuff. It had a book on starships, for Pete's sake! 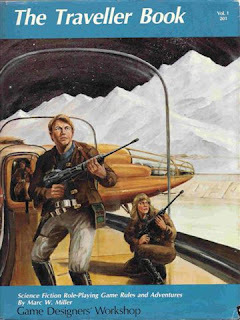 While Mongoose has had an edition in print for the last few years (and it is OGL, so anyone can publish material for it - and I have vague ideas of using it as the basis of a variant SF game to publish), the real deal has been away for a long time. The last official version from Marc Miller was Marc Miller's Traveller, the fourth edition of the game (with a couple of 0.5 editions in there, as it were). It was a problem for various reasons, most importantly that there were extensive problems converting the electronic files to match the printer's software (or something like that - I never did find out the real story, all I know is that there were significant errors when unusual characters were in use). Anyway, it looks like all that is in the past, as the long-awaited fifth edition, Traveller5, is the subject of a new Kickstarter campaign. For a hundred bucks, you can get a signed hardcover of the game (which is extremely complete, and 600 pages or so), Traveller dice (one black, one white, and one red), a CD-ROM of the PDFs, and other stuff. As you add more to your pledge, you can get other stuff, but mainly it seems to be a card giving you a land grant and title on an Imperial world, plus the satisfaction of helping out above and beyond. At the really high levels, you can get your (character's) name attached to examples in the rules. Anyway, I'm all about this. You might be, too. While I've been working out stats for various Villains & Vigilantes characters, I've been thinking about superhero games and worlds. There's an aspect of fantasy worldbuilding that isn't present in most modern-day games, in that the worldbuilder has to consider effects of fantastic powers on the setting, and personalities loom large in ways that they do not in the actual world. In addition, I'd probably include the Indiana Jones movies as deep background, just so I could include that wonderful warehouse. What these give me: superscience, aliens, superspies, super martial arts, an afterlife conception, werewolves, spirit mediums, genetically engineered supermen, a society of humans who aspire to be insects, fishmen, vampires, dream machines, astral travel, faeries, UFO/time machines, selkies, magic, cracks in the universe, and Indiana Jones's legacy. That's a good start, I think. What movies or TV shows would you include? One more, and I'll set this aside for a day or two. Maybe I'll do Tyger later on today. 1. Invulnerability: Ignore 25 points of damage per turn. Origin & Background: When her parents could not handle her very high strength, Heidi was sent to a government facility that said it would be able to take care of her. She feels very alone there, while she is being trained as an agent of the US government, but she is starting to form an attachment to Tyger (who will be presented later). What will happen to these children of Project GILGAMESH is a story that will have to wait for the telling. Her code name is one that she was very insistent on having. This time, a brother and sister pair who fight against metahuman supremacists, but are hunted by the police for their crimes. 1. Light Powers: Range 34", Dmg 2d8, PR = 1 per attack; Blinding flash with a radius of 34", PR = 1; PR = 1 to set up a Light defense; May create mundane light for no power cost. 2. Lightning Control: Range 22", Dmg 2d8, PR = 4 per attack; Electrical defense costs an action to start, but no PR or movement to maintain; Control electronics by save vs. Intelligence on 1d20, save vs. Agility on 1d20 to avoid mishaps for each action taken, PR = 4 per attempt, Range 22"; Short out electrical devices, PR = 4 per attempt, Range = 22", 22% chance of success. Origin & Background: Michael played around with his powers from a very early age, but with his sister's help managed to keep them secret from even his parents. The arrogance of being able to do something that no one else could twisted his priorities, and he decided to make his living at the expense of everyone else. He hates metahuman supremacists, though, as he is afraid of no longer being the most special person, other than his sister, in his world. 1. Magnetic Powers: Magnetic control, PR = 5 per attempt, Capacity 850 lbs, Range = 17", Lasts 13 rounds. 2. Lightning Control: Range 26", Dmg 2d8, PR = 4 per attack; Electrical defense costs an action to start, but no PR or movement to maintain; Control electronics by save vs. Intelligence on 1d20, save vs. Agility on 1d20 to avoid mishaps for each action taken, PR = 4 per attempt, Range 26"; Short out electrical devices, PR = 4 per attempt, Range = 26", 26% chance of success. Origin & Background: When Linda's parents found her levitating the silverware, they punished her and made her hide her abilities. That became her reflex, and she learned what she could do very secretly. When she found out that her brother Michael could do similar things, she hatched a plan with him to live a life of crime and adventure. 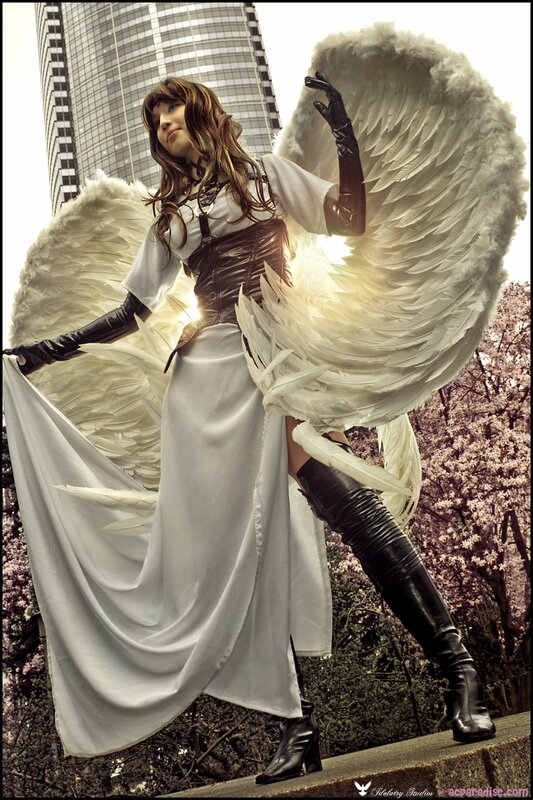 Like her brother, she hates metahuman supremacists, but in her case it is because she has a true sense of equality. Linda likes to fly above the battlefield on a manhole cover or other metallic object, while tossing lightning bolts at her targets. During a robbery, she uses her powers to short out alarm systems and communications devices like phones, computers, and radios before even allowing her presence to be known. 1. Transformation: normally has no powers, but can change into a form that includes all of the following (or back into human form) at the cost of an action. a) Water Breathing: PR = 1 per hour to breathe water. b) Stretching Powers: Maximum 7' 6", square 3' 9" on a side, or block 1' 11" on a side. PR = 1 when used as a defense. c) Regeneration: Take an action to heal full healing rate (max. once per turn). 3. Absorption: Gains 1 hit point per hit point scored on opponent (in hand to hand unarmed combat only); hit points gained vanish when taken as damage or when transformed back into human form. 4. Poison/Venom: Paralysis Venom causes unconsciousness without hit point loss. 15 uses per day. Origin & Background: Always made fun of for his weight, Gordon retreated into study of the tiny creatures under his microscope. 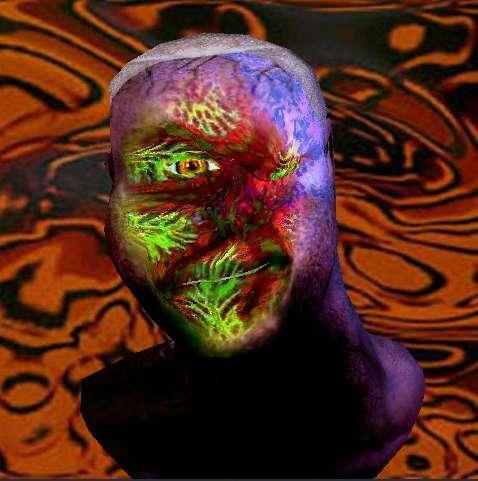 One day, when the taunting of his high school peers escalated to physical violence, the stress caused his mutation to manifest itself by transforming him into a translucent, amoeba-like humanoid creature, and he proceeded to get his revenge on his tormentors. The community was shocked, and he was hunted by the police to stand trial for his crimes of assault. Full of hatred for those who bullied him because he was different, Gordon ran, swearing that the "freaks" would inherit the Earth. Now he does all he can to make that happen.